Setting the agenda for the state government, the Congress today announced that those guilty for alleged phone tapping would be punished after completion of the inquiry within the next two months and the charge sheet against the BJP would be handed over to the Vigilance and Anti-Corruption Bureau for a time-bound probe. The state government has withheld new pay scales notified by the previous government for employees of the Kangra Central Cooperative Bank (KCCB). With its eyes set on winning the Lok Sabha elections next year, the Congress today took some major decisions aimed at countering BJP propaganda, gearing up its membership drive and making people at the grassroots aware about irregularities like phone tapping committed during the BJP regime. Dalit devotees call it an assertion of their rights. 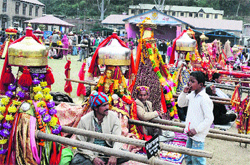 ‘Dalit’ devis and devtas are making their presence felt at Mahashivratri and Kullu Dasehra fairs. They are getting support from Communists, who are die-hard atheists. Chief Minister Virbhadra Singh today launched the Earth Hour signature campaign of the World Wide Fund (WWF) for Nature-India, giving the message to individuals, business, educational and other institutions and organisations to ensure a better future planet and combat climate change by switching off non-essential lights for one hour on March 23. Chief Minister Virbhadra Singh launches the Earth Hour signature campaign in Shimla on Saturday. A labourer was killed after a portion of the third floor of an under-construction building of the Regional Hospital gave way here today. The first General House of the party was held here today after formation of the Congress government and installation of Sukhvinder Singh Sukhu as state party chief. AICC general secretary Birender Singh Chaudhary, Chief Minister Virbhadra Singh, former Union Minister Sukh Ram and other Central and state leaders were present. Office-bearers sought a thorough probe at the earliest into reported irregularities committed by the PK Dhumal regime pertaining to land deals, power projects, private universities and controversial projects. Birender Singh lambasted the BJP for the alleged phone tapping. He said it was a serious offence and amounted to violation of fundamental rights. “We are aware that the people have reposed faith in the Congress and we want to assure them that we will come up to their expectations. At the same time, all irregularities committed by the previous regime will be probed so that the guilty can be punished,” he said. “Phone tapping is a serious matter and action will be taken against those responsible for it within two months by when the Vigilance Bureau will complete its probe,” the Chief Minister said. He added that a copy of the Congress charge sheet submitted to the President would soon be handed over to the Vigilance Bureau for inquiry. Birender Singh and Virbhadra Singh said there was perfect rapport and understanding between the government and the party. “I am just a postman and there is no interference on my part at any level. The government and the Cabinet have freedom to take decisions independently,” Birender Singh said, refuting charge of interference by the high command. He lauded the Budget presented by Virbhadra Singh and said the promise of unemployment allowance had been kept and a provision for subsidised rations had been made. Most speakers demanded speedy action against various irregularities committed by the previous regime. Denies interference by party high command in govt working. The Registrar, Cooperative Societies, has written in a letter to the KCCB Managing Director that under Rule 4(a)(II) of Bank Employees Service Rules, approved by his office, scales proposed are not in consonance with pay scales of the Punjab State Cooperative Bank. It has been pointed out in the letter that this has led to an anomaly and is in contravention with revised scales of the Punjab bank due to which approval given by the office on February 27 is withdrawn. The Registrar has warned that action will be taken if the order is not implemented. The previous government allowed the bank board to implement new pay scales on September 29 last. The board approved new pay scales on January 31 and the state government issued a notification to this effect on February 27. The Kangra Central Cooperative Bank Employees Union has flayed the move. RC Thakur, general secretary of the union, said they resented the order. bank and the same were formulated after scale-wise mapping. The uniom threatened to move court if the government did not implement new pay scales. Sources said the tussle over the post of Chairman might be behind the decision of the state government to withhold new pay scales for employees. The Congress, in a minority on the KCCB board, wanted to instal Jagdish Sapiya, a nominated member from Kangra district, as the Chairman. Incumbent RS Mankotia moved the High Court and obtained a stay order on the election. A majority of members said a nominated member could not be the Chairman. They said the change would have been smooth if the Congress had proposed an elected member’s name. AICC general secretary Birender Singh Chaudhary said a six-member task force would shortly be set up to counter BJP propaganda against the Congress regime and bring before the people the real picture. He said a mechanism would be put in place to ensure that there was perfect coordination between the government and the party. Chaudhary said the party would be geared up to ensure that the Congress won all four Lok Sabha seats. He said everyone would be held accountable. “Block and district Congress committee chiefs will have to give good results to justify their posts,” he said. Former legislator Harbhajan Singh Bhajji was appointed state coordinator for the membership drive. “If the organisation is strong, there is no reason why we will not win the parliamentary elections,” he said. He criticised the BJP for renaming several Centrally sponsored schemes after Atal Bihari Vajpayee. State Congress president Sukhvinder Singh Sukhu said the party set-up would take up to the village level the issue of phone tapping and make people aware about the illegal act. “We will counter BJP propaganda on changing names of schemes as they started the trend by changing the name of Rajiv Awas Yojna to Atal Awas Yojna,” he said. Sukhu said the Congress had named schemes after leaders who had sacrificed their lives for the nation and made a significant contribution. “The Congress has regard for Vajpayee, but the BJP had gone against tradition by naming schemes after a leader who was alive,” he added. Resolutions expressing gratitude to AICC chief Sonia Gandhi for leading the party for 15 years and thanking Chief Minister Virbhadra Singh for presenting a Budget which took care of interest of all sections of society were adopted. The third resolution which was adopted pertained to wining the Lok Sabha elections while seeking suggestions from office-bearers for improving the set-up of the party. These devis and devtas are staking claim to berths, rations and board and lodging a the commercialised Mahashivratri fair. They are carried in raths or on shoulders and the Paddal Maidan has been flooded with them. The devis and devtas Shanivar, Chandra Shamsher Singh, Kali Banshira, Himani Chamunda, Kash Bijli, Durga Loilug, Vanchur, Shivputra, Laxmi Narayan and others are doing the rounds, seeking presentations and donations. These are being brought here by Dalit devotees. “We were not allowed to participate by kings, but could take part now,” said ‘pujaris’ Dula Ram, Man Das and Om Chand. The CPI and the CPM have shown double standard. The idols of these devis and devtas are carved by traditional artisans and are doing brisk business. “We do not believe in devis and devtas, but support ‘Dalit’ ones as their devotees had been suppressed by feudal lords,” said Bhupender Singh, general secretary of the CPM. “We do not believe in the institution of devis and devtas, but ‘Dalit’ ones should get the same respect and support as others,” said CPI leader Des Raj. Non-Dalit devotees say the fair has been politicised and commercialised. “Villages have different devis and devtas, but how long will this go?” asked Narayanu, ‘kardar’ of Hurang Narayan, and Piyar Singh, caretaker of Pundrik Rishi. Kardar Sarvdevta Committee president Shivpaul said devis and devtas had no caste and ‘dev sanskriti’ had no room for politics. He said the committee should investigate the 41 new applications. “It should be known whether the applications are by individuals or the community. The general house never okayed their registration. Politics will damage the ancient institution,” he added. On the occasion the Chief Minister gave the message of “Save Energy Save Climate.” The lights of three important buildings of Shimla, Town Hall, Oak Over and Church, would also be switched off. The Chief Minister lauded the efforts of the WWF to organise such awareness activities in schools and colleges and said similar action by the entire world would help in saving power and creating awareness about climatic change, which the world was witnessing due to global warming. The WWF had also appealed to citizens to participate in the Earth Hour campaign by switching off their lights from 8.30 pm to 9.30 pm on the designated date. Forest Minister Thakur Singh Bharmouri and Chief Secretary S Roy also signed the campaign. Deceased Bihari (24) of Jharkhand received severe injuries after the fall. He was rushed to the hospital, but he died due to internal injuries. Additional SP Padam Negi said a case was registered against the contractor.